Does the slogan “bigger is better” hold true for outsourcing pharmaceutical activities? In previous years, the “one stop shop” Contract Manufacturing Organization (CMO) was all the rage and the benefits, apparently, were many: reduced costs, improved knowledge sharing, more efficient technology transfer, and shorter timelines. More recently, there seems to be a shift in the winds. Larger CMOs are actually downsizing while smaller CMOs are growing organically, even during a challenging economic period.1 Although a cross-functional outsourcing operation is important for some areas of drug development, the pharmaceutical industry recognizes that this is not necessary for all areas and the advantages claimed by the “all in one” service provider are not always so. However, the less experienced, small innovator pharma company (<150 employees) looking to outsource activities may be attracted to the “all in one” offering. With thousands of CMOs available in the global market, all companies are challenged with selecting a suitable outsourcing partner. For Small Pharma, working in the very risky area of clinical development, choosing the right outsourcing partner is critical. Selecting the wrong partner can lead to trial delays and cost overtures that cannot be withstood. With so much at stake, where does one start? The process seems rather daunting to Small Pharma companies with little outsourcing experience. Figure 1. Balancing Core Characteristics. As discussed later in this article, these core characteristics are also reflected in Small Pharma’s outsourcing strategy and are inherently different than those of their Large Pharma counterpart. In an ideal world, the supplier selection process would be two-sided: the outsourcing partner would seek to understand their potential client and determine if the client is also a good fit. Unfortunately this usually does not happen, resulting in dissatisfaction on both sides. Figure 2. Small Pharma Business Strategies. 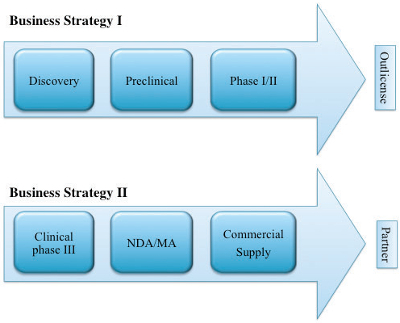 Strategy I: Discovery and development of drug candidates to proofof- concept in man (Clinical Phase I/IIa) followed by out-licensing/codevelopment of the candidate to a larger firm with resources to further advance to Phase III. Strategy II: In-licensing a late stage (Clinical Phase III) drug candidate and partnering with a larger firm with resources for commercial production. Both business strategies require an input of funds from an external partner/buyer, but the long-term strategy is very different, driving different CMC outsourcing needs. In many cases, a large service provider, specializing in commercial supply, is not a good fit for companies working under Strategy I. Their regulatory processes are heavier and slower, leading to longer timelines and greater expense. They implement more validation and testing requirements that are not needed in early phase and their analytical capabilities focus more on routine quality control. This does not mean that the quality of a Phase I candidate is not important, but the techniques used to ensure this are different. A Phase I candidate requires extensive analytical testing for structural elucidation, polymorphism, and impurities. This takes sophisticated instruments such as NMR (COSY/NOESY/DOSY/HSQC), XRPD, TGA, DSC, and LC-MS/MSa and specialized personnel to interpret the data. These instruments and required expertise are not routinely used or found in the QC of commercially focused manufacturing plants. A supplier who understands their potential client’s business strategy, and the demands of the strategy, will know immediately if they are a good fit for the client. In turn, a Small Pharma company who understands the service providers’ core business functions will be able to make an informed choice. All companies are under pressure to contain fixed costs, and both Large and Small Pharma depend on service providers to perform tasks, solve problems, and improve efficiency. Traditionally, Large Pharma uses providers to strengthen internal capacity and capabilities while Small Pharma relies on service providers to complete those core competencies, which they lack internally. For instance, most Small Pharma companies do not have the knowledge or technology to manufacture GMP material. Regardless of the business strategy, they lack the necessary equipment to support larger-scale synthesis and often do not have the quality infrastructure required to produce material according to GMP standards. 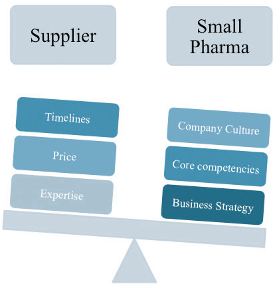 With little internal capabilities, outsourcing drug supply is a key activity for Small Pharma. Unfortunately, many Small Pharma companies, focusing in early clinical development, often do not understand the importance of this activity. The first pre-clinical/clinical batches set the standard for later phase clinical development as the biological safety level is generally determined by early clinical studies.2 Of more concern, though, is that some service providers do not understand the requirements for submission of an investigational new drug (IND) or clinical trial application (CTA). ICH rules for clinical trial material are ambiguous and service providers may approach their supply of this material in a variety of ways: proposing to do too much or not enough. The former will create a strain on the budget, while the latter may result in longer-term, more expensive consequences. While drug manufacture takes a back seat in Phase I, it comes to the forefront during late phase development. There are defined activities and industry regulations (ICH, FDA, EMEA, CDER, etc) leading to a longer and more complicated outsourcing program. A different regulatory strategy is necessary along with a higher level of Good Manufacturing Practices (GMP) compliance and, as regulatory scrutiny increases, the risk of a clinical hold is more probable. Considerable planning is required as manufacturing problems encountered will have a bigger impact on budgets and timelines and can lead to additional unplanned drug development activities. Choosing the right CMO at this phase is crucial as transferring a process due to supplier dissatisfaction would be a major set-back. Certainly there is overlap between early- and late-phase clinical development. The development process is a continuum, always building upon previous work performed and knowledge gained. It is not impossible to find one supplier who can work in all development phases successfully. However, key for Small Pharma is to seek out complete and customized solutions rather than standard services that are equally applied across all phases of development. By working with a supplier who understands the intricacies of each clinical phase, a phase appropriate program can be developed, resulting in savings in time, money, and effort. Company culture is often not duly considered when evaluating outsourcing partners. Outsourced work is an extension of the business, and as such, working with a partner who holds similar values is important. A small company who moves fast and takes decisions quickly will want a supplier who can do the same. A supplier who is bogged down in processes and procedures will appear painstakingly slow. In many cases, Small Pharma companies do not consider company culture in the decision-making process and it is only after a culture clash occurs that they realize that this fundamental criterion was not met. Take for example a company who prides themselves for their transparency, commitment to excellence, and ability to move quickly, but then works with a low-cost provider in a time zone that is difficult for proper communication and quick decision making. Disappointment may come later when the quality of the work is not up to expectations, interactions are difficult, and timelines are not met. Of the three factors to be considered when picking the right outsourcing partner, understanding the culture of the service provider is certainly the most challenging. It requires time and effort and can’t be determined in a single meeting or discerned by reviewing a work proposal. Ultimately it should be supported with an on-site visit and a face-to-face meeting with the potential team. Seeking out references from close contacts can also help build a better understanding of a supplier’s culture. Keep in mind also that changes in leadership at CMOs can lead to changes in culture. Therefore this attribute has to be continually assessed and reassessed. Some suppliers are aware of the importance of company culture in the decision-making process. They take steps to remain connected with prospective clients even when there is no immediate demand for work. For both Small Pharma and the service provider, this type of relationship building is priceless. It helps both sides determine in advance if their competencies, business strategy, and company culture are in sync and, if the answer is “yes,” then the path to a successful outsourcing program will be paved. As previously discussed, Small Pharma should take into consideration their company culture, business strategy, and core competencies when picking their supplier. After the right supplier has been selected, the desired outsourcing strategy can be determined. Of the key outsourcing strategies used in the industry—transactional, preferred partner, and strategic alliance—Small Pharma companies often choose a transactional approach. They outsource specific activities on an as-needed basis under short-term contracts. This differs from Large Pharma, who takes advantage of both ends of the outsourcing spectrum, establishing both comprehensive, strategic alliances and short-term, transactional relationships (Figure 3). Although long to establish, the advantages of the strategic alliance are many, and over the years, large companies have announced these relationships with both off-shore CMOs and local CMOs.3This strategy, however, does not normally fit well into the Small Pharma tool-box as the key drivers are fundamentally different. The need for control has a large influence on Small Pharma outsourcing. As shown in Figure 3, a high level of supplier control and ownership is achieved by using a transactional outsourcing strategy. In many Small Pharma companies, employees are empowered to perform their jobs and accountability is high. As a result, maintaining control over the work performed is important. This requires establishing a partnership with constant communication, complete transparency, and frequent exchange of information. The wrong supplier may view this as intrusive, timeconsuming, and a burden. Often large “onestop- shop” CMOs are less receptive to this type of interaction. They are often juggling multiple projects at once and are under pressure to get onto the next project as soon as possible. So, yes, it is true. A large program at a CMO will be more important than a small program at the same CMO. At smaller CMOs, there is a better chance that the status of small projects will be elevated and along with that will come the interaction and consideration that is often desired. In the last decade, there has been a shift in the CMO sector with more Asian CMOs entering the market at lower prices, which seem attractive. Pressure is on to reduce costs and as CMC activities do not always drive asset value, cheaper is better. 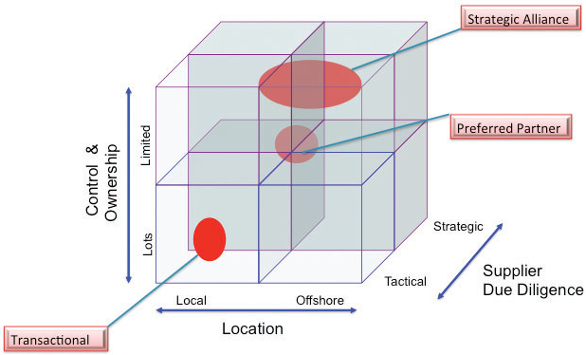 Although tempting as it may be to outsource manufacturing activities to Asia, this relationship does not always work well for Small Pharma due to limited internal resources for supplier management, the high desire for supplier control and ownership, and the complexity of maintaining this control at offshore locations. Although Asia has strength in synthesis of generics and bulk raw materials, they are still in their infancy when it comes to chemical development, clinical trial supply, and Good Manufacturing Practices. Poor quality and lack of compliance are still issues in Asia4 and the risk is even higher for clinical trial material, where there are no clear regulations for GMP standards. The clinical development domain requires special CMC regulatory knowledge and most Small Pharma companies do not have the expertise to monitor the work and quality output of these inexperienced facilities. This results in a discordant arrangement as Asian CMOs require more technical and management oversight than Small Pharma can give. Consider also that over the years, the price gap between Western and Asian CMO costs has been closing. From 2004 to 2009 the average cost of employees in Asia increased by 50%.3 As Asian economies develop, the cost advantage, which was significant 10 years ago, is no longer as stark. In retrospect, the additional work required to manage Asian suppliers and the higher compliance risk easily makes up the price gap. Small Pharma companies operate lean organizations and, unlike Large Pharma, they do not have dedicated procurement and outsourcing departments. In most cases, an individual within the company, with other core obligations, selects and manages outsourced activities. This individual is responsible for all aspects of the supply, taking care of both administrative and functional activities. As a result, strategic alliances, which require considerable time, executive oversight, and lengthy twoway due diligence, are not achievable for most Small Pharma companies. Small Pharma prefers simple outsourcing contracts, with unambiguous fees and project deliverables that are easily defined and managed. This gives them the freedom and flexibility that they often require to support the high-risk nature of the clinical development business. It also allows them to maintain ownership of the work, which fits well with their sense of empowerment. In conclusion, Small Pharma relies heavily on suppliers to accomplish mission-critical activities. As an important link in the pharmaceutical value chain it is critical that Small Pharma has a successful supplier selection program and outsourcing strategy. In addition to assessing a supplier’s experience, technology, and capabilities, a two-way assessment should be performed in which Small Pharma and the supplier evaluate the fit with company culture, business strategy, and core expertise. By considering these factors, an informed decision can be made that will hopefully lead to a long-term symbiotic relationship. Ultimately, this is a win–win situation for everyone. By choosing the right fit, Small Pharma can spend less time managing suppliers and more time focusing on innovative ideas and technologies that will feed Large Pharma’s pipeline and bring needed therapies to the market. Press Release: Pharmaterials announces expansion of Reading site and addition of new stability facility: Oct. 7, 2013 and Nov 27, 2013; Outsourcing pharma.com. 22 March 2012, AMRI to end operations at Hungary site, Nick Taylor; Boston Business Journal, 26 July 2013, Swiss drug company Lonza laying off 200 people in Hopkinton, Hannah Fingerhut. Food and Drug Administration CDER. Guidance for industry, Q3B (R2) impurities in new drug product (July 2006). Economist Intelligence Unit, Asia Competition Barometer: Pharmaceuticals, 2012. Time magazine. Nov. 13, 2008, Heparin’s Deadly Side Effects by Bill Powel; FDA Web Site: FDA’s ongoing Heparin Investigation; The Guardian (London). 2 Dec. 2008, Chinese figures show fivefold rise in babies sick from contaminated milk by Tania Branigan; Shanghi Daily. May 2012, High levels of chromium found in more capsules by Xiao, Li; Fierce Pharma. Feb. 2012, Bogus Avastin has cropped up repeatedly, WSJ finds by Staton, Tracy; Reuters Report. Aug. 28, 2012, China’s “wild east” drug store Lee, Melanie and Hirschler, Ben; Drugs.com. Sept 16, 2008, FDA Issues Warning Letters to Ranbaxy Laboratories Ltd., and an Import Alert for Drugs from Two Ranbaxy Plants in India FDA Press Release; Reuters. Jan 24, 2014, India’s Ranbaxy hit by FDA Product ban at 4th Indian Plant by Toni Clarke and Sumeet Chatterjee. Outsourcing pharma.com. Oct 22 2012, Wuxi opens biologics plant with JV partner AstraZeneca in attendance by Gareth Macdonald. Outsourcing pharma.com. July 14, 2013, B-I says Chinese JV Could Elevate Domestic Manufacturing Industry by Dan Stanton. Outsourcing pharma.com. July 2, 2013, Pharma Abandoning East, Returning West say GPCM Delegates by Dan Stanton.